Console | Tools | Search for Message. Selecting a mailbox in the tree presents a search dialog that will search that mailbox. A date range should be set. 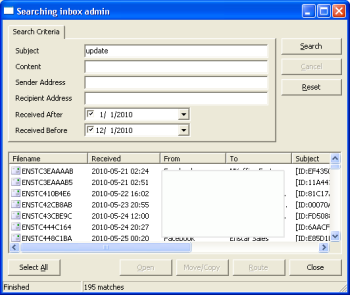 Selecting a mailbox archive in the tree presents an expanded search dialog with an additional 'Mailslots-tab' that iteratively searches all the mailslots. Additionally, you can select specific mailbox Archive/s to search. When you set the Archive-tab in a Mailbox messages are physically moved to a different .afx file so there is also an option to search the Archives. Search results can be 'double-clicked' to open them in a message viewer, or you can select a result and use the button controls in the dialog to Open, Move, Copy or Route the message. Mailtraq webmail also provides a 'Find' facility to allow users to search for messages.